Archaeological excavation at the historic site of the Pony Express stables was conducted by Michael Fisher during the 1990s. Today, the building has been restored and is a popular museum in St. Joseph, MO. Many significant artifacts were found in the well situated inside the stables. Bob Bray (Missouri's first archaeologist to specialize in historic sites) from the Dept. of Anthropology at University of Missouri - Columbia, served as a consultant on the excavation. The excavation photographs at this website were taken by Michael Fisher and digitized by Michael Fuller. The artifact photographs were taken through the museum glass cases by Michael Fuller and Neathery Fuller. Michael Fisher (right) and Bob Bray (left) consult on the work at the Pony Express Stables. The brick building was collapsing before excavation and needed conservation. 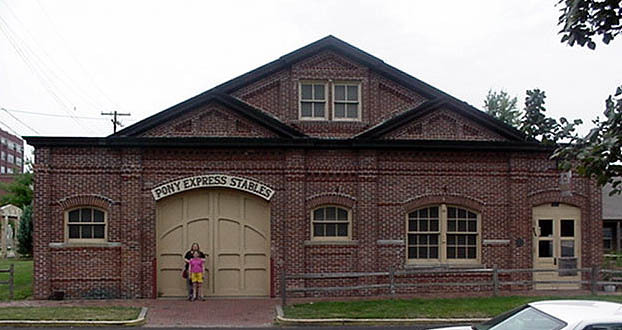 The entrance to the Pony Express stables museum in 2003. Neathery and Amira Fuller in front. Some of the first test units in the back of the stables. Volunteer, amateur archaeologists excavating at the site. Volunteers work to expose the foundations. Wall stubs found just beneath surface. Wall from 1888 cuts original wall stub from 1858. Preserved portion of two walls "inside" the museum and visible below the floor. Edge of well (on left side of photograph) appearing during excavation.